You, you've got what I need. It’s a good week for free games, huh? Blizzard’s handing out free copies of StarCraft, and just down the block now we’ve got GOG.com giving away the slightly less essential, but still fun Saints Row II. 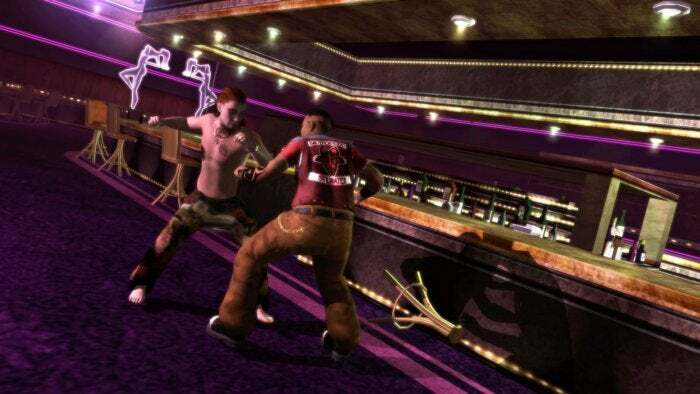 You know, the Saints Row game that was still about a street gang doing street gang things and not like, riding a rocket into space or curing cancer or whatever. To grab Saints Row II for free simply head on over to GOG.com, look for the pertinent banner, and then click the big “GET FOR FREE” button. Pretty simple. And Saints Row II is a good one to grab for free, too. The original PC port was notoriously busted, a fact few seemed to care about in 2008 but which became a greater and greater issue as Saints Row III and IV introduced new people to the series. One review on the game’s GOG page claims that, “The game actually works now people. You don’t need to copy paste your Steam review here. The issues have been fixed.” I can’t verify those claims, having never messed with the GOG.com version, but it’s worth pointing out: This version might run better than the Steam version, or at least better than the original port. And if it doesn’t? Well, you got it for free. Problem solved. Some other special promotions: The Saints Row games are the latest to utilize GOG Connect—the service where GOG duplicates part of your Steam library to try and entice you with sweet, sweet DRM-free copies of your games. If you’ve linked your accounts you’ll be able to add DRM-free copies of any Saints Row Steam titles you own into your GOG library. And if you don’t own them? Well, they’re all on sale for 75 percent off. The sale and the GOG Connect offer lasts until April 27, while free copies of Saints Row II are only available through Saturday, April 22. Might as well march on over right now, while you’re thinking about it.